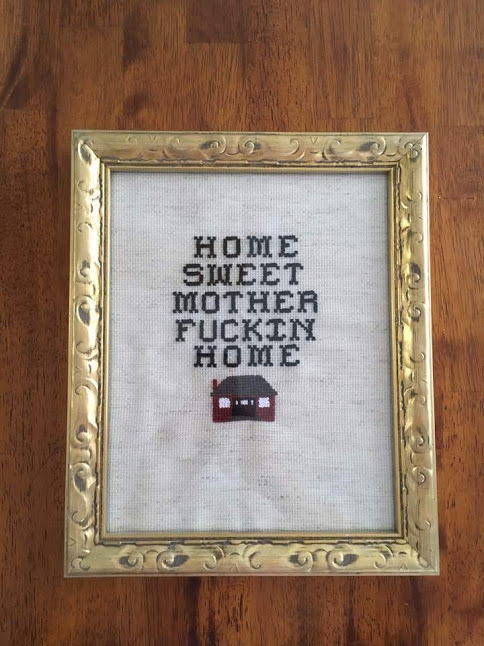 When I was a kid, my mom did all the crafts. I can thank her for one thing, and that is that I was also born with the crafty gene. As a youth, I was fortunate enough to have the opportunity to learn crafts and skills such as ceramic painting, wood working and painting, sewing, corking, cross stitching, pen and ink, drawing, acrylic painting, knitting, beading, gardening, cooking, baking, house painting, canning and calligraphy. I wanted to learn it all! Some things never change. Though through college and my (blurry) early 20’s, I took an absence from crafting, aside from design schoolwork. It was a busy time, and my mind was preoccupied with other things like parties, dates, and guitar hero. When our eldest was one we had the opportunity to live at my in-laws house, to save money for a house of our own. Now I will say I am blessed to have the best in-laws ever, so the time spent there was full of fond memories. The only sour remembrance, was after we had finally purchased our house. We bought a house from plans and had to wait for it to be built, which is fine. Except that the closing date was pushed back 3 times, making us wait almost a year. So many times we had to defer things like job start dates, utilities, and daycare. It was brutal to get all excited and then get let down time after time. The stressful rollercoaster definitely took a toll on my mental health. I ended up going to see my family doctor and explained how I was exhausted and stressed all the time, and that I didn’t know what to do. After we deduced the tiredness was due to the fact I was super anemic, I was all fixed up with some Iron supplements. For the stress he told me to get a hobby. I laughed at first, but he persisted. He told me to try a sport, or knit, or read. Anything to get my mind off the stressful things. Of course! Why didn’t I think of that! So I decided on knitting. That way, I could work on something while I was watching tv or hanging out with my little one. So a knitting I would go! I tried to make leg warmers for my daughter. They turned out ok for a first attempt. I did a few other little projects and then decided I was pro enough to knit a blanket. 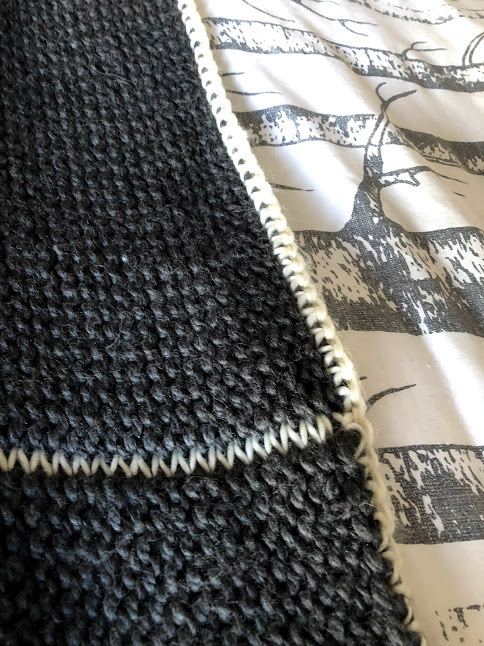 I found one fabulous blanket pattern (for free!) online and decided I would make it. Well that project lasted me through the rest of our stay at my in-laws, and well into our new house. It saved my sanity. My husband thought I had turned into an old lady (he might be right). One of my dearest friends started knitting too and we would have the best time drinking some wine, watching tv and knitting together. They key is not to drink too much, otherwise your creation starts to get a bit wonky. All in all, after a few knitting hiatuses, a move, and about 5 years, the blanket was complete. It was perfect. It ended up fitting our queen size bed it was so large. After finishing up my ginormous blanket, I decided I would try and remember how to cross stitch. Seeing as I am a super slow knitter, cross stitch would be much faster. The patterns I did as a kid were the usual cutesy things like cats and birds and adorable little houses. Which is great if that’s what you’re into. 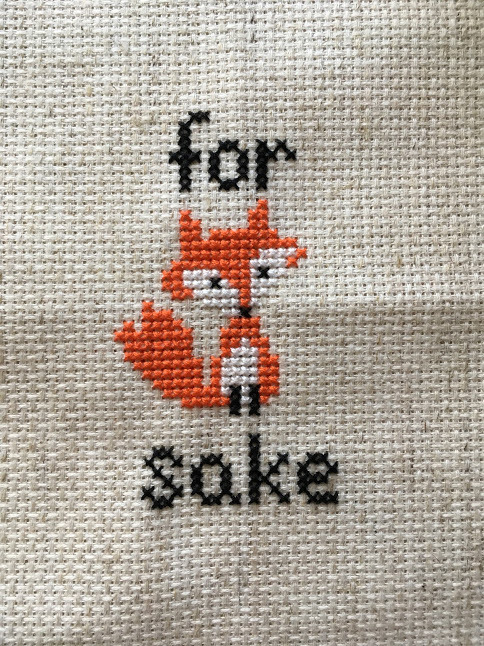 But I discovered subversive cross stitch, and that was right in my wheelhouse. 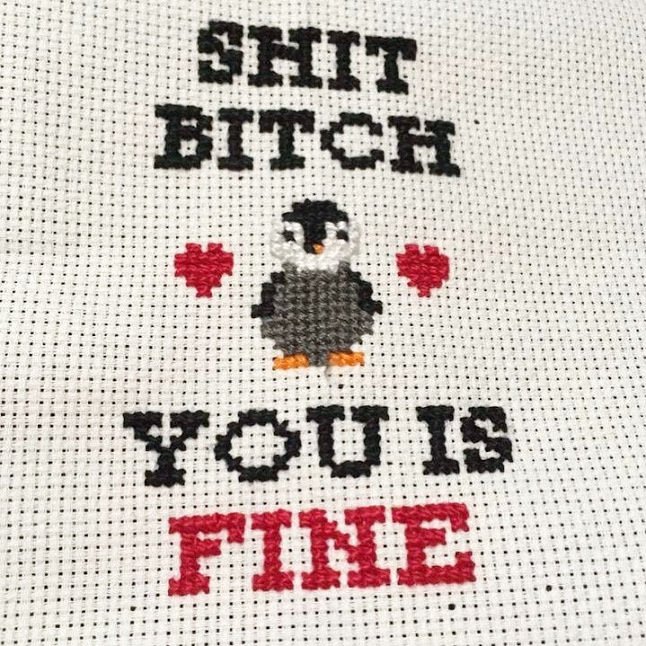 A way to combine my snarky, sweary style, with some healthy craft therapy. 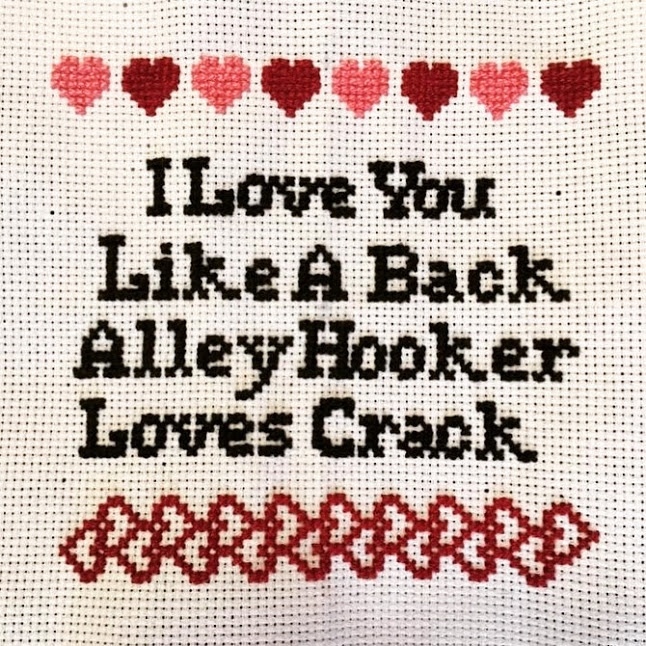 This began my loving relationship with cross stitch. I do it to calm my brain after the craziness of a long day. Now I’m at a point that if I don’t have a project lined up after I finish one, I get stressed. I’m addicted. I make most of my creations for friends and family, but I do also sell them. But I made it my goal to never turn it into work. Just what I do for fun. Maybe earn a little extra cash on the side. Mostly to support future cross stitch projects. (Here comes a shameless plug) If you would like to buy one of my cross stitch creations, please check out my Facebook Page! While crafting in our farmhouse, I found myself wondering if previous owners used to sit and do the same thing? In the past, before technology took over our lives, it was normal for men and women to have hobbies to pass the time after work was done. Now we tend to rely heavily on TV and the internet. This makes me sad. I know we all do it. I am as guilty as anyone. Now arts and crafts are becoming extinct because not many are keeping up the tradition. I fear that one day quilting, whittling, pottery, candle making, and the like will no longer be found. 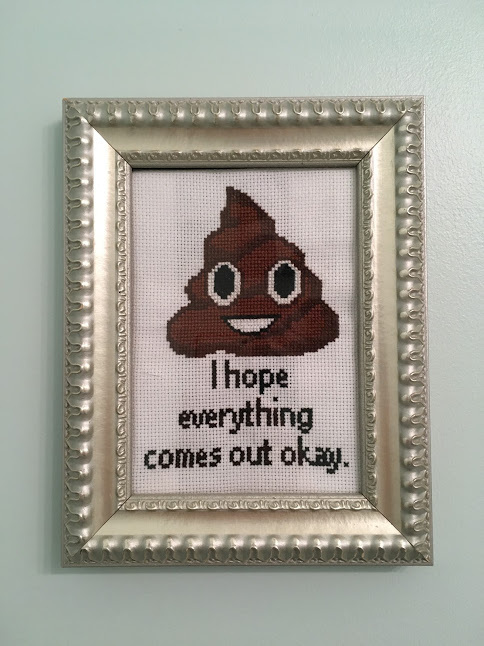 I do have hope for the needle arts. 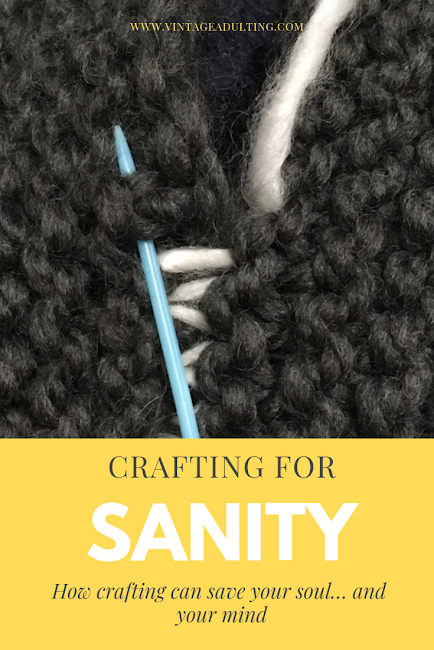 Currently there is a surge of people taking up knitting, crocheting, and cross stitching. It makes me so happy. These crafts will survive another generation. This is my true hope, and the basis of this blog. That the “old way” of doing things will not be lost. That all the things our parents and grandparents tried to teach us, will not be forgotten. Making things with our hands, sculpting something out of your imagination can be a tough journey, but is oh so rewarding. I believe that everyone possesses a creative gene. A want to make something, to give it life. Whether its crafts, food, cakes, furniture, photos, instruments, music, graphics, or even buildings! Find your hobby. Find what calms your mind and makes your soul dance. I’m not saying creating is easy, but it should make you happy. Even if it sometimes drives you a little crazy. Get out there and do it. With all the resources online, anything is possible! I learned how to knit from youtube and a book called “Knit Step by Step” (linked on Amazon above). You can find anything online. If I can do it, you can do it! Make magic happen! What is your favourite way to create? What things did your grandparents make? Please share your favourite memories or crafts in the comment section below.